If you already have a license of ProMax, you may download the latest version by creating a log-in here. If you do not have a license of ProMax, contact us today to learn how! Mixed Species are mixtures of individual components that appear in the component list as a single component. Predefined mixtures of fixed composition such as air, ASHRAE designated refrigerant blends, and more. User Defined Mixed Species where users can create their own single-component that represents a blend of pure species. Allows importation of geographic information system (GIS) data to create pipeline networks in ProMax. Sources can be kmz, kml, or shp formats. Data reduction allows for simplification of expansive data imports to increase speed while maintaining fidelity of the information. The GIS Tool’s graphical interface shows real plotting of data as well as manipulation without the need to re-import the data. Populates missing pipeline elevation with data from satellite scans of the Earth’s surface. Can overlay other important geographic information that may be missing from the GIS data, such as geopolitical boundaries, locations of energy facilities, and more. A new pipeline dialog called the Flowsheet Tool allowing for consistent and comprehensive viewing of entire pipe networks in ProMax. Available to all ProMax users (security device update required). The new Alkylation block converts C3, C4, and C5 olefins into alkylate (mixed C7, C8, and C9 iso-paraffins) plus C11, C12, and C13 poly-alkylation products. The poly-alkylation products undergo further cracking before leaving the reactor. The block allows for convenient investigation of reactor temperature, iso-butane/olefin ratio, and outlet olefin leakage. Both HF and Sulfuric Acid systems available. Model refinery delayed coking processes where heavy petroleum fractions are cracked into lighter components, such as gas, gasoline, and gas oil. Predict product yields using a fully customizable yield model. Study the effects of recycle ratio, drum pressure, and furnace temperature on unit performance. Relate drum outage height and cycle time. Anticipate the effect of feed Micro Carbon Residue (MCR) on coke production rate. Integrate with Vacuum Tower model to evaluate the effect of changing Vacuum Tower operations on the coker unit. Simplified User Interface making for easier implementation. Reduced number of required inputs for fixed-bed reactors. Solve time dramatically decreased, in most cases by 80% or more. Hydrodenitrogenation (HDN) reactions now available for complete modeling of hydrotreaters and their effluents. Flare Tip to predict radiation, destruction efficiency, and noise following API Recommended Practices 521. Seal Drum to determine relationship between geometry and pressure drop for forward flow through a liquid seal, as well as predictions of a vacuum condition, following API Recommended Practices 521. Tee/Wye blocks that estimate pressure losses at piping junctions. Membrane block to predict fluid separation from partial pressure gradients across membrane surfaces. Inflow performance relationship (IPR) for both gas and oil wells using a variety of methods and correlations. Multiphase vertical flow relationships through production tubing. Production improvements through artificial gas lift. Effect of surface choke setting on production rates. Optimization of surface production equipment to maximize production rates. 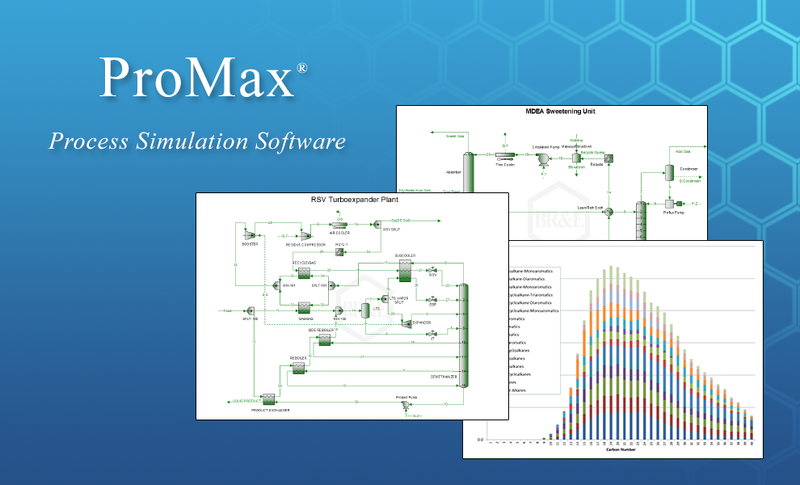 Easily model the allocation of hydrocarbons through a production facility, pipeline system, gas plant, and more! High fidelity modeling with strict adherence to first principles. Greatly reduce component list to a single set: no component duplication required! Fully evaluate the effect that one production well has on another. Calculations can be automated to perform the accounting monthly, daily, or even hourly! Built-in worldwide database of characterized crude oils. Additional bulk properties available as input, such as bulk viscosity. User-defined properties allow for distribution of a variety of properties, such as sulfur distribution, metals, nitrogen, and more!